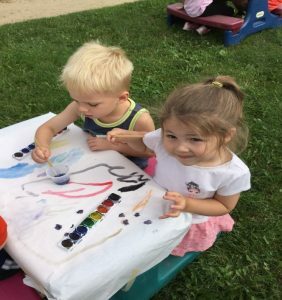 St. Mary Child Care Center has nurtured and educated young children to develop into future learners for nearly 30 years! Our proven approach to childcare and leaning has supported hundreds of parents to raise happy, healthy and positive children. Let our team of professional caregivers help your child thrive and successfully reach their developmental milestones! 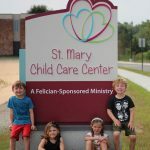 St. Mary Child Care Center offers programs for children ranging in age from 2 weeks to 6 years old. Preparing your child for Kindergarten begins in preschool, and we are here to help! Enroll your child in programs designed for mental, social and physical development today! The Infant Program (2 weeks to 18 months) focuses on consistent love, attention, praise, concern and caring! Our child care professionals help your child grow to be a curious and happy toddler! The Young Preschool Curriculum (2 ½ to 3 years) centers around learning through creative play. We practice communication and problem-solving to develop independence and relationships. The Kindergarten Readiness Program (4 to 6 years) creates social interaction with exposure to basic Kindergarten academics. Your child matures into a young student ready to meet the next challenge! St. Mary Child Care Center in Livonia, Michigan has catered to infants and toddlers for almost 30 years. Our child care professionals create a positive and loving environment for children living in Michigan. Your child's education begins in the infant years as they begin to discover the world around them. Our staff of trained professionals help your child explore the world around them and engage with other infants and their caregivers every day. Growth in the toddler years is promoted through each child’s curiosity. Our toddler programs are designed to encourage, wonder and inquisitiveness. Our team works daily with your child to achieve developmental milestones and educational goals. Our play based approach to learning allows your child to learn through group and self-directed activities. Your child will work toward becoming independent, learning to communicate and building positive social interactions. The Kindergarten Readiness Program at St. Mary Child Care Center focuses on preparing your child for Kindergarten. Your child will build upon the academics introduced in preschool such as letter and number recognition, sequencing, counting, and foreign language. Both indoor and outdoor interaction will help your child to grow socially and physically. Your child will exhibit more independence and want to share his/her amazing experiences with you. The road to Kindergarten has never been so fun! The safety, well being and comfort of your child is our main priority. At St. Mary Child Care Center, we believe children thrive in a safe and secure environment. Our staff is trained to ensure your child is safe, nurtured and educated. St. Mary Child Care Center is equipped with safety badges for all parents, staff and administration. Cameras are positioned throughout the exterior of the building to assist in keeping your child safe. Beyond the secure environment is our core philosophy of nurturing your child as they develop their primary abilities. From cognitive and physical development to emotional and communicative skills, we give your child a safe place to flourish as they grow from year to year. Our staff of child care professionals is trained in child development with many years of experience in caregiving and childhood education. 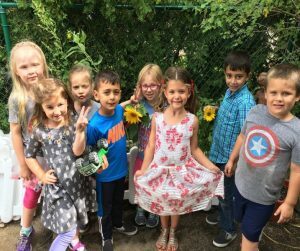 Our team is dedicated to seeing your child grow through exploration, curiosity, wonder and creativity. Our Lead Teachers hold degrees in Child Development, Early Childhood Education or another related field. We attract nurturing and caring team members. Our staff is certified in CPR, First Aid and Infection Control. Child to adult ratios are maintained at or below state requirements. Providing A Foundation For Success Through Felician Core Values. Call Us Today At (734) 793-4600 or Click To Learn More!